Qasid’s Online Private Tutoring (OPT) enables advanced students of Arabic to get personalized, one-on-one instruction with Qasid’s faculty without leaving the comfort of home. New and current students—as well as alumni looking to build upon their intensive studies at our institute in Amman — can cover any of Qasid’s 900 hour core programs in MSA, Classical, Arabic for Diplomats, Business Arabic, Conversational Arabic or get specific training in manuscripts, classical texts, media Arabic, translation or modern Arabic literature from our faculty. WHAT IS THE ADVANCED PRIVATE TUTORING PROGRAM? Qasid’s Online Private Tutoring (OPT) enables you to get personalized, one-on-one instruction with Qasid’s faculty without leaving the comfort of home. Whether MSA, Classical, Arabic for Diplomats, or Conversational Arabic, get access to one of our expert faculty members that have a deep, specialist’s focus that will attend to your learning goals. You get one 50 minute live session per week with your instructor. A collaborative communications platform is used to facilitate interactions between you and your instructor, providing clear audio transmission as well as intuitive, on-screen writing capabilities. New and current students—as well as alumni looking to build upon their intensive studies at our institute in Amman can move either faster or slower through Qasid’s 900 hour core curriculum. You no longer have to worry about trying to fit your schedule into a Qasid-determined once-per-week group time.With 1-1 sessions, your instructor will have multiple times for you to choose from, and you select one that works for you. This radically simplifies timing, and helps to increase the odds that you’ll be able to make each and every live session. You Can Test Drive Two Sessions of the OPT Program, 100% Risk Free. Our mission is to help you achieve a high level of fluency in Arabic and realize your full potential so you can accomplish your academic or professional goals. That’s why we invite you to take the first two sessions of our program risk-free. If you don’t feel we’ve delivered on our promise within those Modules, we’ll happily refund 100% of your money. We’ve answered your most frequently asked questions here about whether the Advanced Private Tutoring program is right for you. We’ve pledged to always be honest with you, and We’ll tell you whether this course is right for you or not. The OPT program is for new and current students—as well as alumni looking to build upon their intensive studies at our institute in Amman—will find benefit in a robust program that goes significantly beyond a series of generic, VOIP based chat lessons. OPT is ideally suited for those of you who learn best one-one-one, have harried schedules that make intensive studies at our institute in Amman not feasible, desire to move either faster or slower through Qasid’s 900 hour core curriculum, have a learning style better suited to a non-class structure, or require an instructor with a deep, specialist’s focus. OPT can be used as a supplement to university study, as a full-term class in and of itself, or as a means of getting up to speed before travelling to our onsite campus in Jordan. A collaborative communications platform is used to facilitate interactions between you and your instructor, providing clear audio transmission as well as intuitive, on-screen writing capabilities. Students can request sessions to be recorded and available for download without extra charge, allowing you to review subtleties in each lesson. 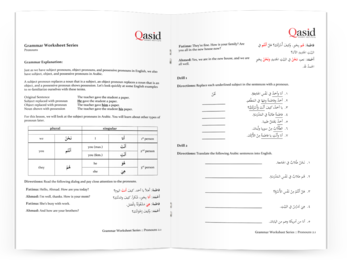 Students can cover any of Qasid’s 900 hour core programs in MSA, Classical, Arabic for Diplomats, or Conversational Arabic. Students looking for specific training in manuscripts, classical texts, media Arabic, translation or modern Arabic literature can also get specialized training from our faculty. Your sign-up for as many sessions as you’d like in the OPT program. These sessions can either be weekly or daily. However we do have a minimum requirement of taking at-least 10 sessions with one lesson once a week. What I've already done some Arabic before? All students entering into the program will be required to take a placement exam that will test students on their previous Arabic knowledge and ability. The exam will be reviewed by our academic team and students will be assigned to one of the six courses in the program. The exam is a diagnostic test and not a pass/fail exam. Students will be informed of their results within 48 hours. What are the prerequisites of taking the OPT program? We require all students applying for the program have at-least two years of university level of Arabic or the equivalent before applying. Otherwise we recommend you consider our core MSA and Classical program. For Qasid alumni, we require you have completed at least Level 2 or above before applying. All new students(non Qasid Alumni) entering into the program will be required to take a placement exam that will test students on their previous Arabic knowledge and ability. The OPT Program is open throughout the year for registration however students that apply 2 weeks before Qasid Amman terms dates have a greater chance of requesting either a specific instructor for their study or finding a teacher at their requested time. Take an online placement quiz. Wait for your placement quiz to be reviewed. Book an orientation session with your instructor. What should I expect during the placement test? The placement test is a diagnostic exam, so don’t worry there is no pass/fail at the end of it. You will be given a series of multiple choice questions and you will also be required to give us a recording of your answers in Arabic. 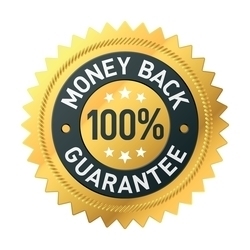 We stand by this course with a 100% money-back guarantee. Because we extensively tested it, we know the course works. Try the entire course and decide if it’s right for you. However — and this is important — only join if you intend to follow the action steps. This course is not simply to consume information. It’s designed for you to take action. If you ask for a refund, we will require you to tell us what aspects of the program you didn’t deliver. Unfortunately, we are not offering any discounts nor instalments plans for the OPT program.